The "Star Wars" version of Monopoly will add a game piece based on the female character Rey after an 8-year-old girl wrote to game maker Hasbro complaining about the omission and telling them: "Girls matter." 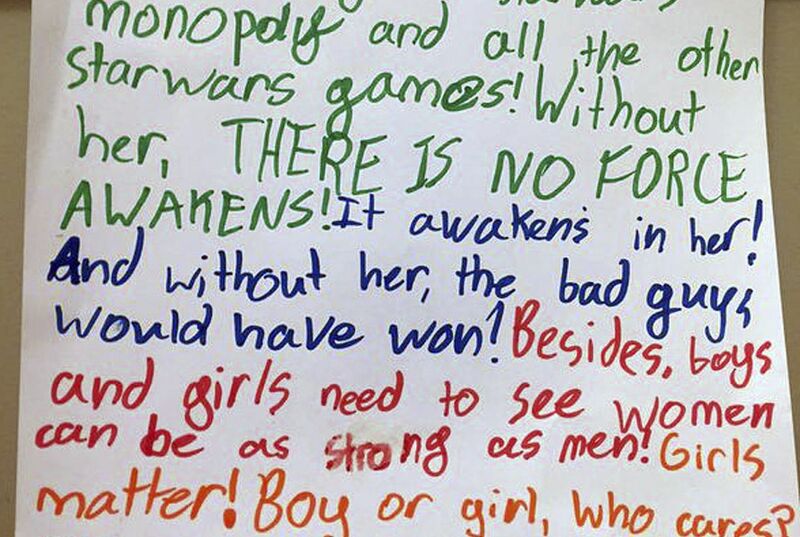 Carrie Goldman, of Evanston, Illinois, posted a letter on Twitter written by her daughter, Annie Rose, asking why Hasbro left out Rey when she is a main character of the latest movie in the series, "Star Wars: The Force Awakens." The letter begins by asking the company why it would exclude the heroine of the story. "Without her THERE IS NO FORCE AWAKENS! It awakens in her! And without her, the bad guys would have won! Besides, boys and girls need to see that women can be as strong as men!" she wrote. "Girls matter!" The original game includes just four pieces, all modeled on male characters: Luke Skywalker, Darth Vader, Finn and Kylo Ren. The decision to exclude Rey led to a social media debate, with many fans tweeting under the hashtag #WheresRey. Goldman, an author who has written about toys and gender issues, included the hashtag as she tweeted a picture of her daughter's letter to Hasbro. Hasbro responded in a tweet of its own. "We love your passion for Rey and are happy to share that we are including her in the Monopoly: Star Wars game, available later this year," it said. 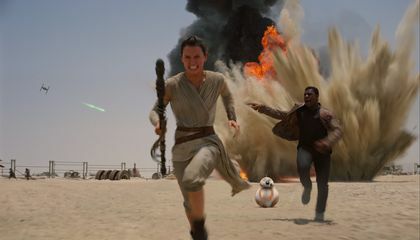 Julie Duffy, a spokeswoman for the Pawtucket, Rhode Island-based company, said it did not include Rey in the game to avoid revealing a key plot line. The game was released in September, months before the movie was released, though Goldman noted that at the time it was well known that Rey would be a central character. Goldman said the response to Annie Rose's letter shows she struck a nerve and people are ready for a change. "A huge number of the messages I'm getting are from men. This is not a women's issue, it's about representing the hero of this film," she said. Duffy said anyone who already bought a Rey-less game can contact Hasbro when the updated game comes out and request their own Rey token. How did “old media” and “new media” bring about change? I think that it is pretty nice to have these people make girls character for the new Star Wars monolpoy game. I'm pretty sure that they need to talk a lot about this game before that added that n character, Rey. It is pretty impressive to have a girl character in the game when there is already four boy characters there. They are much stronger and better than Rey, but the Star Wars movie says that the force awakens. So if must mean that the force awakens in Rey. That movie was really good and I wish that I can see that movie again so that I can talk to my friends during the movie and when my friends ask me what happens next, I can tell them. I think that this is the first for me to see all of these people debate over a monolpoy game that everyone plays for a girl character. Next time, they should add at least one girl character ( if there are any girl characters). I hope that this trend doesn't affect the people making the game and I hope that there isn't going to be a war became of this. Older media and new media brought change to the popular Hasbro game, Monopoly a couple maoths ago. When 8-year-old Annie Rose wrote a letter to Hasbro spokeswoman, Julie Duffy, she made it very clear to Duffy that "Girls matter!". She had recently bought the new Monopoly Star Wars: The Force Awakens themed game. Little Annie had noticed though, that a figurine of Rey, the main heroine of the new Star Wars movie, was not included. "Without her THERE IS NO FORCE AWAKENS! It awakens in her! And without her, the bad guys would have won! Besides, boys and girls need to see that women can be as strong as men!" Annie Rose said. Afterward, her mother, Carrie Goldman, who is an author that writes about specifically gender roles in pop culture, posted the photo to Twitter. In just a few short weeks, the hashtag #WheresRey was trending all over social media pages with the fans anxiously asking why Rey did not appear in Monopoly. Hasbro later responded saying that "anyone who already bought a Rey-less game can contact Hasbro when the updated game comes out and request their own Rey token." I think this is cool because I never knew this. I was surprised that Hasbro would leave out Rey. Rey is one of the main characters, why would they leave her out? I wonder what their reason was. I am glad that Hasbro said that they would add in Rey. If the girl did not write the letter, then the complaints would get worse. Answer: Old media and new media brought about change by promoting the girl's letter. Before addressing this answer, I would like to muse about the question. Do you realize that this article does not mention the terms "new media" and "old media", this can leave readers in the dark (no pun intended) about the topic of this inquiry. In the spirit of this article, I would request an adjustment. To help future readers, the term "new media" means, of mass communication using digital technologies such as the Internet. "Old media" is referring to the forms of communicating prior to the digital world, which include analog radio and TV and printed materials such as books and magazines. Another grievance is towards the vast answers that this question imposes, such as, the old media allowed us to communicate. or the new media allowed us to access practically unlimited information. You see, these are perfectly good answers yet don't even refer to the article. I am sure that future readers will better interpret this article if you rephrase the question. People in the 21st century are more diverse and politically correct than we were ever before and we should respect gender equality in the real world but Star Wars only had a few female characters to start with and we should respect that this is a long time ago in a galaxy far far away. Disney picked unexperienced actors to play the main roles that were black and female just to reflect our new enlightened culture, but if a board game has to choose 4 characters for the pieces than doing two old iconic characters and the hero and a villain of the new movie is a good choice, so this all comes down to Finn vs Rey as the hero piece and Finn has more screen time so I don't think this was sexist, because board games have 4 pieces instead of 5 normally. I can tell that this girl has not seen the movies and just like James Bond with its sexism because it was created at a more sexist time, we should not make changes to movies just for good political score points. Hiring horrible actors from my standards, at least for a 30 year anticipated movie was not a good idea. "Old media" and "new media" brought about change because in "old media", this young girl would most likely send a letter directly to the company. Due to the creation of "new media", the girl's mother was able to post a picture of the letter on social media to get it spread throughout our nation. The picture was trending therefore drawing a lot of attention to the point that girls do matter! Possibly without the social media trending tag, Hasbro could have never seen the note and could have kept the game the same it once was. I thought this article was interesting because this one girl changed the face of the new Star Wars Monopoly game. I also thought that it was awesome how this young girl could come up with such a strong argument that girls do matter! E decision to exclude Rey led to a social media debate, with many fans tweeting under the hashtag #WheresRey" (paragraph 5). Rey is the protagonist and main character of "Star Wars Episode VII: The Force Awakens", so it is only right that she be represented in a board game version of her story. Old media and new media joined together to bring a feminist message to Hasbro Games to include the heroine of the new Star Wars movie in their themed Monopoly game. This article surprised me because as a feminist, Disney fan, Marvel fan, and Star Wars fan, it shocks me that Disney would allow a game to be marketed which did not include the film or property's main protagonist, especially if that person represent a strong female lead. The #wheresRey on social media got started because Annie Rose, of Illinois thought that the heroin of the film needs to be in the new monopoly game. "Without her THERE IS NO FORCE AWAKENS! It awakens in her! And without her, the bad guys would have won! Besides, boys and girls need to see that women can be as strong as men!" she wrote. "Girls matter!" This post started to make people around the country start to want to see Rey in the monopoly game as well. The designer of the new monopoly game responds with "We love your passion for Rey and are happy to share that we are including her in the Monopoly: Star Wars game, available later this year," and "anyone who already bought a Rey-less game can contact Hasbro when the updated game comes out and request their own Rey token." The old media brought good culture and good movie structure. Wile the new media brought new culture to film like girl main characters. They also stated that girl can be as strong as men. This shows that women rights have grown over the years. It's great to see people, especially young kids, speaking their mind. Hasbro made a good choice by reacting to the letter and adding Rey, who is apparently a main character in the latest Star Wars movie, to their Monopoly game. If they had ignored the letter, it probably would have turned many people against their company.